Ashtar Command Book Blog : Holy cow! “The Myth of the Holy Cow” is a controversial book by Dwijendra Narayan Jha, an Indian historian. It was published during the first BJP government, the BJP being a right-wing Hindu nationalist party. The author and the original publisher were threatened by both BJP supporters and the even more extreme VHP. The Indian edition was banned by the Hyderabad Civil Court, ironically after a complaint by a Jain (a peaceful religious group). Eventually, a new edition was published abroad after well-known leftist intellectual Tariq Ali had intervened to aid D N Jha. What caused all this uproar? The central argument of Jha's book is that the cow hasn't always been considered holy in Hinduism. This is a politically contentious claim, since the BJP and other Hindutva groups use the sanctity of the cow as a rallying point for (sometimes violent) anti-Muslim mobilizations and also as a marker of communal identity. For Hindu nationalists, it's also important to claim an unbroken cultural continuity from Vedic times until today. If the sacredness of the cow is a modern construct, the entire Hindutva worldview falls apart. Jha's book is dry and scholarly, with lengthy and tedious references to various Hindu scriptures. He also takes on Buddhism and Jainism (which explains why a Jain filed a complaint against the work in Hyderabad). However, Jha does succeed in demonstrating his point. The cow was certainly not sacred to the original Aryans, who both sacrificed and consumed cattle. They also used cow hides and fat. Later, Hindu tradition became more mixed, but never completely pro-cow nor strictly vegetarian. There is ample evidence from various scriptures that cattle was sacrificed in honor of prominent Brahmins, who then partook of the meat. Medical texts recommended various forms of meat for their curative effects. The Hindu epics (regarded as holy writ by pious Hindus) often mention meat-eating, including beef-eating, without questioning the practice. It wasn't until the period we call the Middle Ages that the Brahminical authorities began to question cow-killing. 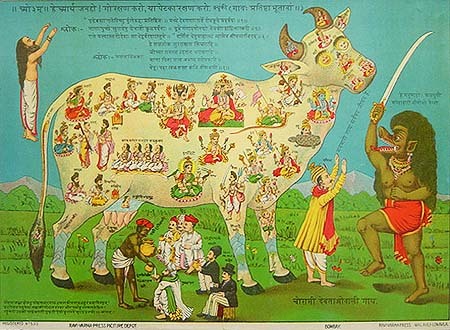 Even then, they indirectly admitted that cattle hadn't always been sacred: cow-killing was only prohibited in the present “dark age” (kali yuga). In some places, the ritual slaughter of cattle didn't end until the 19th century, and the slaughter of the buffalo continued well into the 20th century. Jha claims that early Buddhists and Jains weren't completely opposed to meat-eating either. While they opposed animal sacrifice and preached “ahimsa” (non-violence) towards all living creatures, the Buddhists in particular often adapted to local cultural norms which included such sacrifice and meat-eating. The Jains were more strict, but nevertheless allowed meat-eating under some circumstances, for instance if the ascetic lived among robbers or in isolated villages where no vegetarian food was available. Jha also points out that the Buddhist emperor Ashoka never prohibited the killing of cattle. This is intriguing, since Ashoka prohibited the killing of many other animals, including parrots, bats and ants! Nor was Ashoka himself a vegetarian. The Mauryan emperor consumed both peacocks and deer. I suppose many people's reactions to this book could be summarized in two words: Holy cow!